You are in the right place if you are looking for natural remedies for eczema in children. Two of my children had eczema which affected their day-to-day living. J had very mild eczema as an infant, to which pediatricians would prescribe topical steroids. He responded well, healed very fast so everyone was happy. Each time his eczema appeared, it was steroids to the rescue. When he was about 5 or 6 years old, his eczema took a turn for the worse, his skin broke out and itched like crazy. Steroids closed the wounds beautifully within 1-2 days, but the itching and scratching would start all over again. It was probably his body’s way of protesting against the poisons put into his body. Every single day, he would scratch himself raw. It was a never ending itch-scratch cycle. 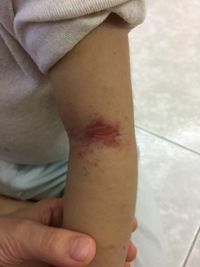 Almost every week, his preschool teacher urged us to do something about his skin, as he was scratching fervently most of the time during lessons, and simply could not concentrate nor learn. He was frequently exhausted and cranky. His health was at an all-time low. He was tested allergic to dust mites, nothing else. Visits to skin specialists saw us going home with more steroids and the verdict that he could never be cured, his eczema had to be managed with steroids and moisturizer, FOR LIFE. M’s story is different. She was born an extremely itchy baby. For the first year of her life, she scratched on her seemingly flawless and perfect skin. Right after her one-year old vaccination, her skin broke out and things just went downhill from then on. Itch-scratch cycle, open wounds, steroids which stopped the inflammation and closed the wounds but just never got to the root of the problem. At her worst, she was crying and screaming all day from the itch and pain, and could not function as a human being at all. She tested allergic to eggs, peanuts and dust mites. Despite cutting off allergens from her diet, her condition did not improve. 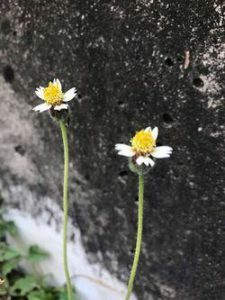 It was heartbreaking enough to see your own children suffer, what made it worse was the helplessness and frustration when nothing we tried seemed to work, and the ‘death verdict’ that they were stuck with steroids for the rest of their lives. Determined not to be defeated by eczema, I began reading up and researching extensively. 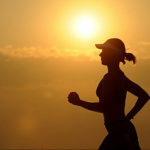 In early 2016, it finally dawned on me that steroids were actually causing the health issues to grow, as they were merely covering the inflammation and pushing the problems deeper into the body, and we were not listening to their bodies, which were trying to present their health issues through the skin. From that moment of revelation, I completely stopped all topical steroids. 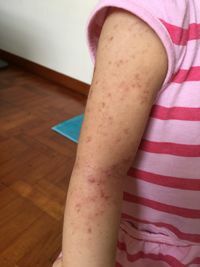 We were not too prepared for even more suffering as the children went through topical steroid withdrawal (tsw), also known as red skin syndrome (rss). 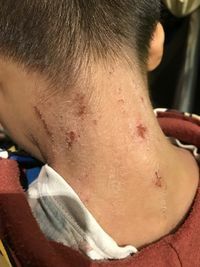 It was horrendous as their skin started to ooze, it smelled really bad, there were still lots of intense itching and pain, coupled with hot flashes when they would break out in whole-body sweat. At about the same time that they stopped steroids, we also gradually went the path of all things natural – natural and wholesome food and supplements, removing eggs and dairy which are some top allergens for eczema, gluten-free diet, natural soaps, shampoos, moisturizers and creams, blending and juicing of fruits and vegetables to load up on all the goodness provided by nature. Over time, they got better. I dare not say they are 100% healed, but the frequencies and intensities of their flares are now much more manageable than before. They are able to enjoy their childhood, with some discomfort during flares. Which is drastically different from the days when eczema would consume their whole lives. Even though I did not experience eczema and topical steroids withdrawal first-hand, I lived it through two of my children. I known how painful it is for eczema sufferers and their families. I hope to help anyone reading this, by sharing our road to recovery. 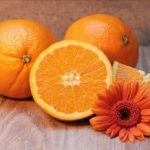 We have lots of experience with natural remedies for eczema in children. Natural is the way to go. It takes time, but it is what your body needs. Have faith, and let’s heal together. I also know how painful eczema is – my son had a very bad case of eczema. I’m eager to learn more as I’m a huge fan of natural remedies and tired of the over the counter steroids and topicals. Thanks for dropping by! I’m sorry that your son had eczema too, hope his condition is much better now. 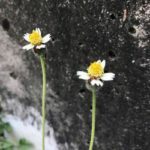 Do check back as I keep blogging about the natural remedies that we use. in our family we also have children with eczema. After reading this i’m hopefull we will get the upperhand on eczema with our children. Hi Lukas, yes let’s keep the faith going so the kids will continue healing! I am sorry for the pain your poor babies went through in the early stages. Kudos to you for taking the stand against the steroids as I’m sure that was tough from all directions since not everyone understands the benefits of natural healing. Bless you and your family on your journey of natural living! Hi Tandy, you nailed it! Not everyone is supportive of going steroids-free! Thank you for your encouragement! Thanks to the insights! Hope to try the natural remedies too! Hi Yi, yes you should give it a try! Natural is the way to go! Could you please elaborate on ginger/acv baths how much in each and how often? But the short answer is here: for ginger baths, cut about an inch of fresh ginger into thin slices, put in about 1.5 cups of water brought to boil, simmer for 10 minutes then add to bath water. Or use it straight, sponging onto damp body with a handkerchief for better effect, but may hurt or sting, so you have to adjust accordingly. For acv, I simply pour about a quarter cup into a baby bath tub of water. Or 1 tablespoon of acv into a cup of water, then again use handkerchief to sponge onto damp body. Everyone is different, so please adjust the strength according to whether your skin takes to it well or not. During flares, we alternate ginger baths and acv baths daily. Hope this helps, do let us know how it works for you! A very well structured website. 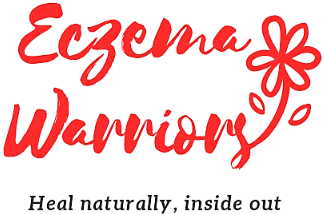 You cover the subject of eczema from every angle, to what it is, how it is cause, ways to treat it naturally, and how our diets affects our bodies. I knew eating healthy was good for our overall health, but I didn’t realize how much it affects our skin. Sp many of your posts are very informative. The best part for me was not just the information, but how you gave tips and advice to apply these ideas to our lives. It is one thing to know something, but it is different when we put what we have learned to good use. I really like the part where you write about, “You are what you eat”. A very helpful website. I learned a lot. I’m honoured that you speak such good words of what is written on this website. Just 4 years ago, I would know very little of these bits and pieces of knowledge and information that I’m sharing here. 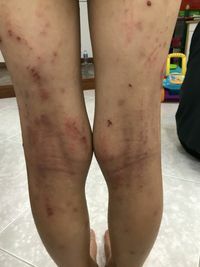 It has been such a steep learning curve, spurred by the heart-wrenching screams and cries into the nights, the relentless itching, the lives turned upside-down by this thing called eczema, that only people in the thick of it would understand. And not to mention topical steroid withdrawal, it gives me nightmares, but I’m happy that for the kids, it’s a thing of the past now. So now I just want to spread the information and raise awareness, so that those suffering can see hope and try to heal themselves through natural means, instead of turning to quick fixes. Thank you for reading my blog, and I’m really glad your niece’s mum finds it useful. Actually you do not have to worry about your niece not taking milk and cheese, as there are many other great sources of calcium in other foods. A few of the best ones are: tofu (if she does not react to soy), calcium fortified non-dairy milk (if she’s taking any dairy free milk like rice milk, oat milk, soy milk, etc. ), bok choy, broccoli, cabbage, kale, lady’s finger, grains and beans. Fig, almonds and chia seeds also have lots of calcium in them. Many people with eczema react to dairy. So in fact it does them more harm than good, as the body is in a perpetual inflamed state, fighting the unwelcome substances in dairy. The body would be too busy to thrive and grow well. To heal from eczema, the very first step is to remove the triggers. I really hope your niece finds some relief from this diet. Everyone is different, so give it a try. If it works, that’s great. If it doesn’t, keep on tweaking the diet and looking at other possible causes to figure things out. All the best, and keep me updated! My little 9 months old keeps scratching her body, but she didn’t seem to as serious as your photos. I am a little concern now. Do I bring to Doctor for them to diagnose? Or do you recommend just to use natural soap, avoid egg (she has rash around her mouth after eating small amount of egg, so we try to keep giving her bit by bit to introduce her)? What lotion or moisturizer you would recommend? To be sure, you can ask for an allergy test. But if you already notice that she develops rashes around her mouth after eating egg, then it should be totally eliminated from her diet, for a start at least. To allow the inflammation to calm. 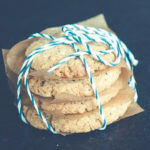 Many kids outgrow their egg allergy by 5 to 6 years old. So I would hold off until that time to reintroduce again. For regular moisturising, I’d recommend Moogoo Irritable Skin Balm, you can read my review here. If it gets infected, or starts to ooze, you may want to use stuff that include some MSM sulphur, or zinc oxide, like these. Oh my goodness, poor baby! I am a mother and seeing these pictures makes me feel so sad! Scratching himself like that I can’t imagine what you went through as a parent! It looks so uncomfortable and sad from my point of view, I am just welling up here 🙁 Crazy that the only option you had at the time was steroids! That is terrible! It sounds like you have come a LONG WAY since then. I mean it pains my heart to see these photos but knowing that you had an epiphany and know that its basically what you feed yourself and using all natural, etc , that means that there is a happy ending to this story. I do see and appreciate where you are coming from though. 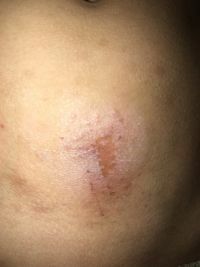 I too have Eczema on my forehead and elbows so I am also looking for some tips on how to holistically treat my Eczema. Thank you! Thank you for your big heart, for feeling for my eczema warriors. Yes we have come a long way, though they still do have the occasional flare, it’s really nothing compared to their condition those years back. 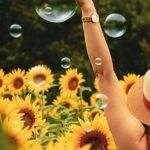 I hope you find relief for your eczema too, do hang around and check out each category on the menu, see if they can help you in one way or another. Mainly we worked on diet, as well as what we put onto the skin. The rest are peripherals like natural cleaning products around the home, things like that. My mother suffers from eczema. As a child I remember her using a butter knife to scrape her skin for relief. None of the creams worked for her. I did a lot of research and tried to help her. 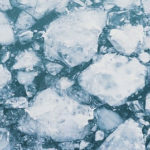 One treatment I came across that worked for many was the use of the dead sea salt. It worked for my mom. It breaks my heart to read this. It’s really difficult for family members, when severe eczema happens to the young or the old. I’m so glad that your mum found relief from dead sea salt.